One of my favorite signs of spring is discovering amphibian eggs, whether they be frog, toad, or salamander. 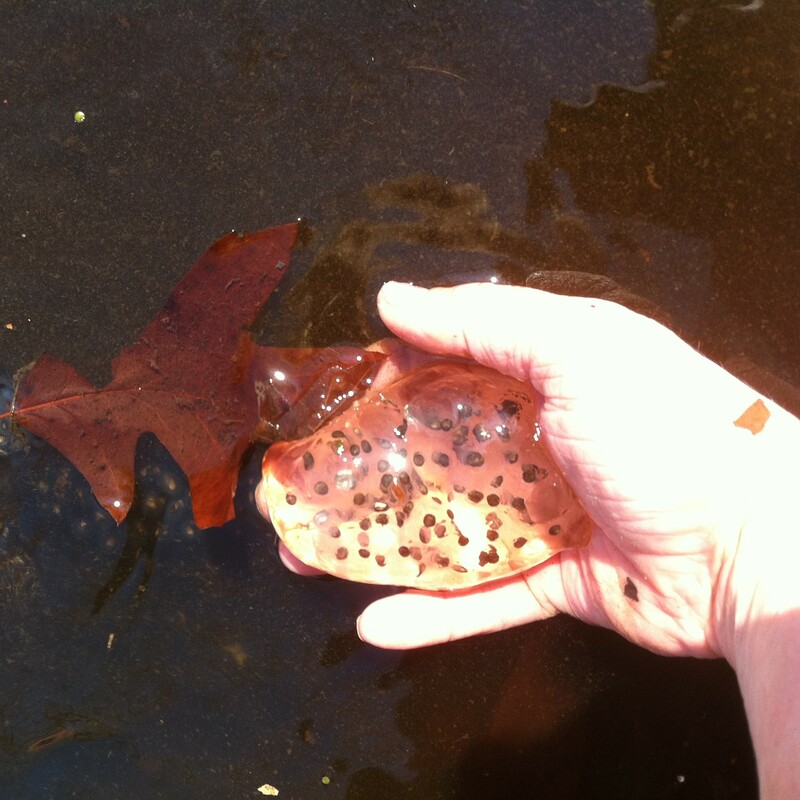 I was very happy when we found salamanders and their eggs while opening the fish pond at Bayfields. 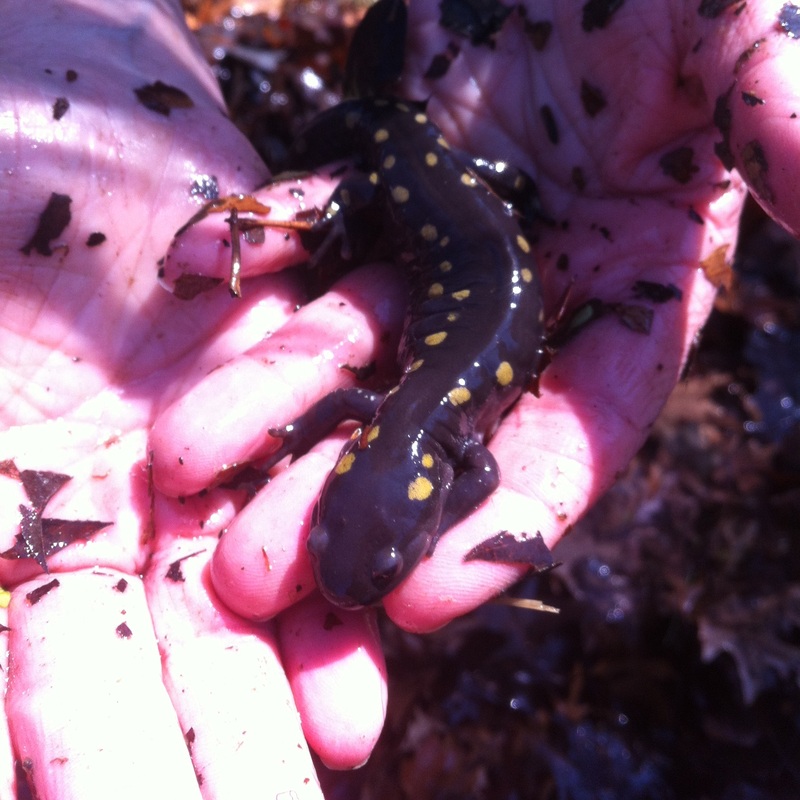 We discovered three Spotted Salamanders, (Ambystoma maculatum). Each one has a unique spot pattern. We let them go, back into the pond. They are active at night. After the salamanders are done with breeding and egg laying, they will return to their underground burrows in the woods. The eggs will hatch in May-June, with feathery gills, and no hind limbs. 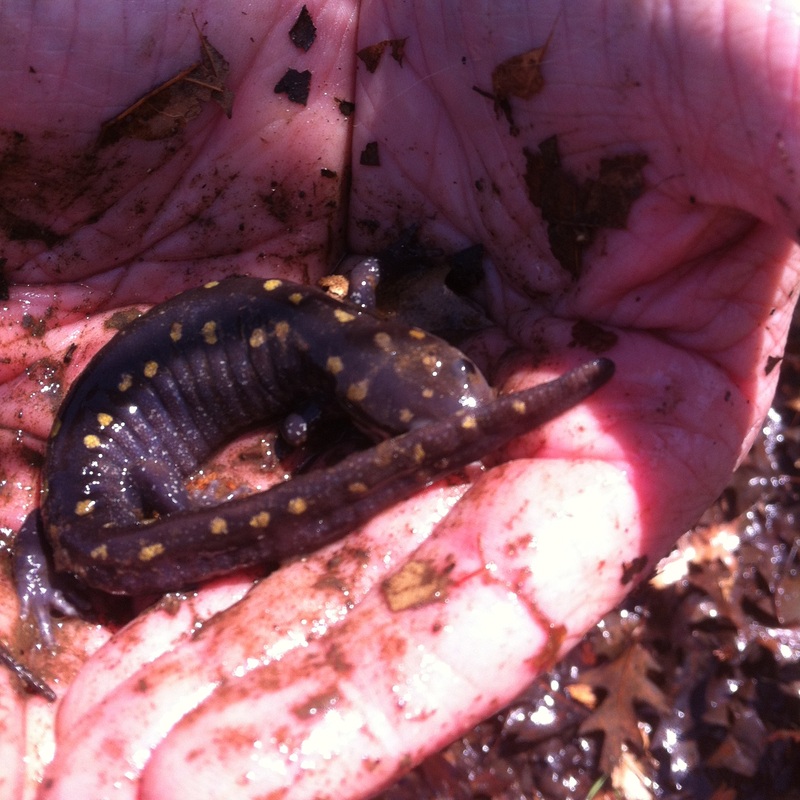 The new generation of spotted salamanders will leave the pond in August or September, travel back to their forest home, and get there spots soon after. 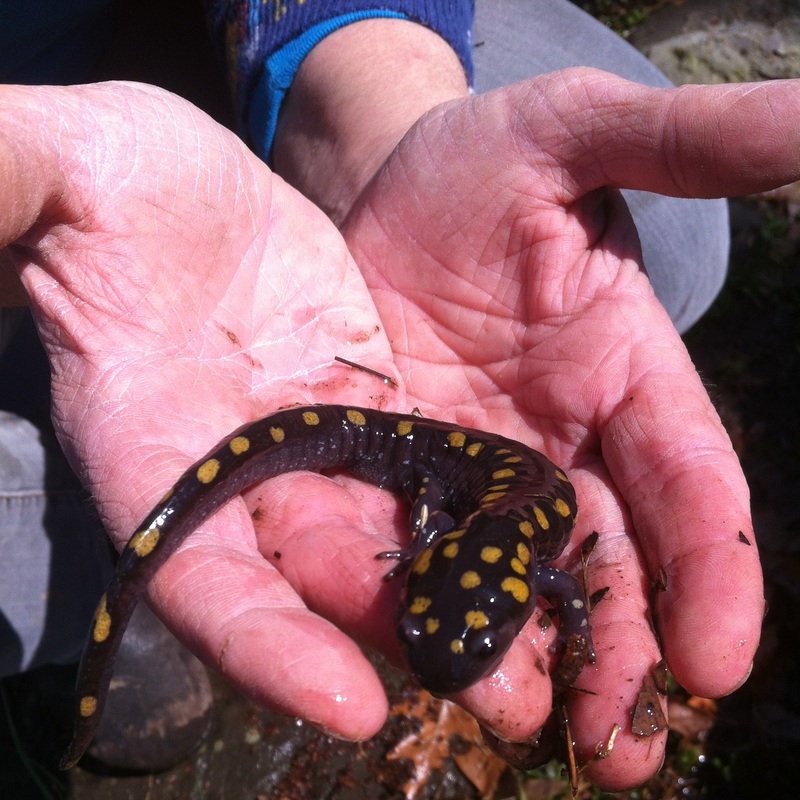 You can learn more about the Spotted Salamander at the Maryland Department Of Natural Resources page, and the Towson University Herpetology page for the Spotted Salamander. Bayfields is a bed and breakfast on the West River, in Maryland, with a great view of the Chesapeake Bay. Make your reservations to travel to visit us! You can learn more, and make your reservations, with bnb, here. 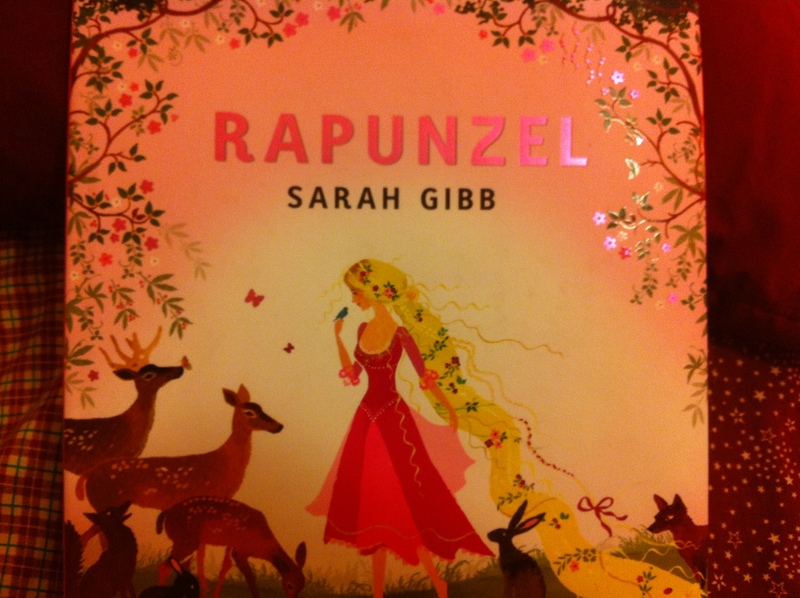 Rapunzel had a room with a view. Bayfields guest rooms have storybook names and we include a copy of the matching story in each room. My grandparents often enjoyed weekend guests here at Bayfields because it’s a lovely place, a peaceful retreat, and a beautiful getaway spot. Upon moving back home, I’m inclined to agree. I’ve had visitors from as far north as Watertown, New York, as far west as San Francisco, California, and as far south as Orlando, Florida. One such weekend, I gave up the master bedroom to a visiting couple and I stayed on the 3rd floor. At that time, I had cast and crutches, so as I crawled on hands and knees to the very top floor, I envisioned myself climbing to the top of Rapunzel’s tall tower. With a leg in a cast, depending how I felt those days, I was either the witch or the princess. Of course, as soon as I would lay back in the bed, far from the noises of the rest of the world, I certainly felt like a princess, resting on her pile of mattresses high above the kingdom. Rapunzel, the 3rd floor guest room at Bayfields Bed and Breakfast, showing off it’s red and white theme, has a warm glow at dusk. 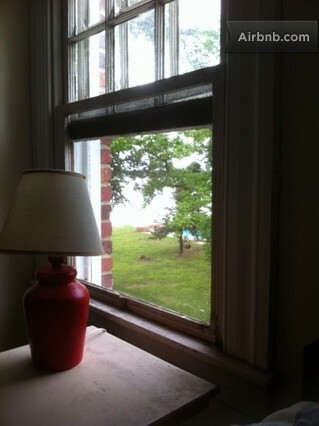 The view from up there is like no other in the house; the beckoning pool, my childhood home next door, the field where summer games were played, where horses sometimes graze, view overlooking my grandmother’s once prize-winning flower garden, plus a sparkly glimpse of the Chesapeake Bay. Even after the guests were gone and I had the house to myself again, that summer I’d often sneak up there to get away for a while. A secret nook, a private tower. The name Rapunzel seemed fitting for our first official guest room. 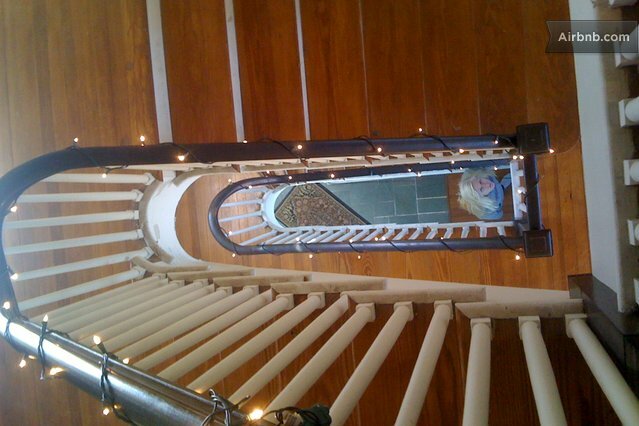 During the holidays, it was exciting to have the entire stairway twinkling with lights. Bayfields Bed and Breakfast has two guestrooms on the 3rd floor. From the Rapunzel, the 3rd floor guest room at Bayfields Bed and Breakfast, looking down the hallway to Hansel and Gretel, the other 3rd floor guest room. 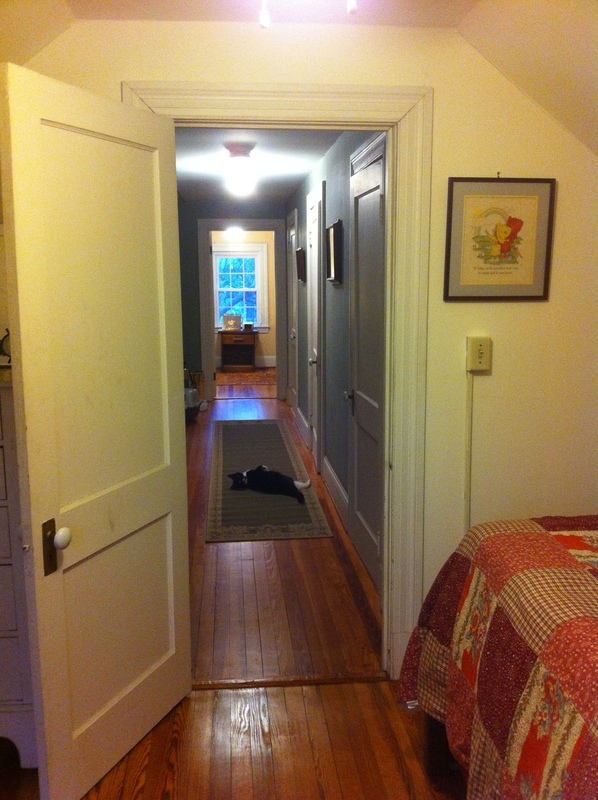 The cat you see on the floor is Kiki, our elusive cat, who only shows up when we have guests. The park-like setting of Bayfields Bed and Breakfast is so peaceful and quiet. 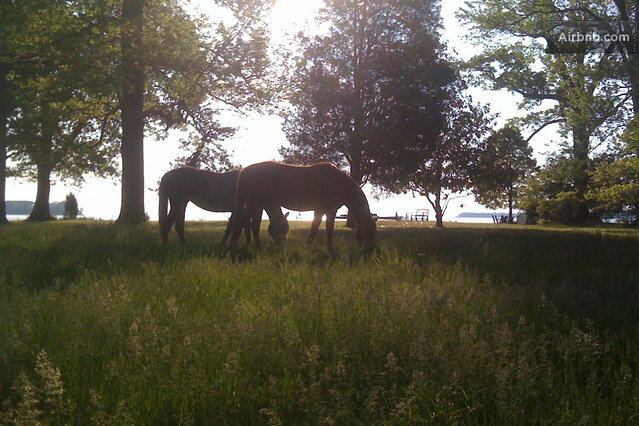 The two Arabian horses(Dusty and Sweetie) enjoy the golden morning sunlight as they snack in a nearby field. Rapunzel, the 3rd floor guest room at Bayfields Bed and Breakfast, showing off it’s red and white theme. To make this room more restful and inviting to guests, I added a Sealy® memory foam mattress. We installed a new ceiling fan/light fixture, plus extra outlets. The hardwood floors were refinished and the walls were painted. I discovered two mismatched white dressers from other parts of the house, plus an old red table I found tucked away deep in a closet. I painted the dresser knobs red to match the table, and without leaving the house, I found a burgundy carpet, red lamp, white night stand, red flowerpot, and a white bookshelf, creating a cosy uncluttered feel with a red and white theme. As we know that there’s nothing more comforting than a fresh set of sheets and towels, so between guests, we launder each room separately, using the sanitize feature on both washer and dryer. Click here if you’d like to reserve a room.